We wanted to offer a microphone floor stand that was as lightweight and as portable as possible without compromising strength, adjustability and robustness. And a sensible price tag was also a requirement! Our AFS1 Microphone Floor Stand with Boom Arm is the result. This collapsible tripod boom stand has a sturdy die-cast and steel construction that offers superior resiliency with great flexibility of positioning, so it's always convenient and never conspicuous. Its black finish ensures an elegant yet unobtrusive presence and its light weight means it is really easy to carry. In short, the AFS1 provides the strength and versatility you want with the portability you need. Clutch locks vertical shaft at any height from 34" to 56"
Our universal heavy-base black table stand is one of our most popular microphone stands. Perfect for across the table interviews or table narration and works with all the microphones we offer, and the clips provided with any of them will fit this stand. This table stand is perfect for maximum portability because its legs fold up for easy stowage. Not as rigid as our heavier ATS1 but still fine for use with all the microphones we offer, and the clips provided with any of them will fit this stand using the thread adaptor provided. 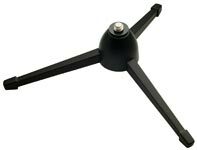 This versatile table stand and handle is ideal for use with all our solid state sound recorders because it has a camera thread to mate with them. 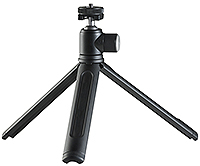 It is made of lightweight but sturdy aluminium and its clever design enables it to be perfect both as a tripod (with its angle-adjustable ball head) or as a handle depending on need. Great for when you want to decouple your hand somewhat from the body of your recorder in order to reduce handling noise.